Ready For Launch – Riverfest Balloon. Now that our Riverfest photo contest is over, I can post anything I want from the event. Not that there is all that much…but I was fascinated by this balloon launch. 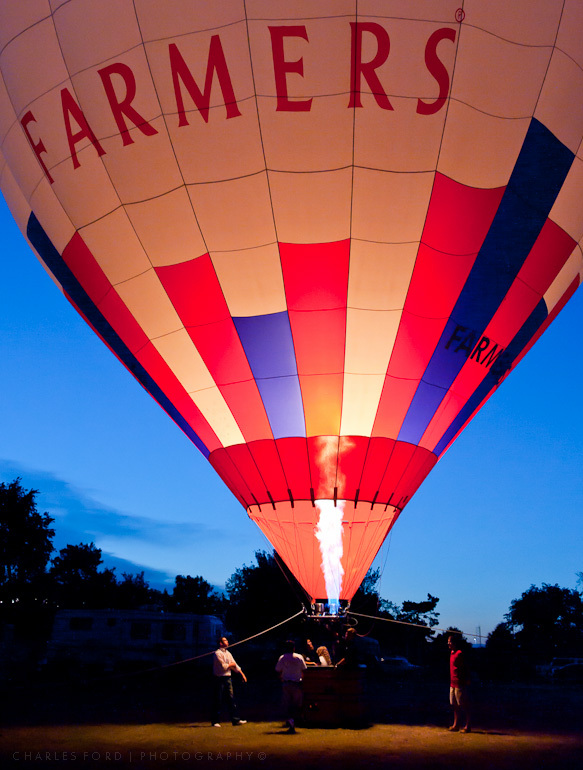 Farmer’s Insurance was giving tethered balloon rides. In the past they have had some trouble getting everything working, including the weather, but this year they had some luck. I hovered around quite awhile, shooting while the sun set. I thought this was a good example of the high ISO capabilities of a my full frame Nikon D700. Coupled with the rather amazing noise reduction capability of Lightroom (still using version 3), this is the result. Handheld at ISO 3200. That’s amazing stuff to me, but I am old and used to shoot Kodachrome 64. I’m ready for fall. Anybody else? There’s only so many 100+ degree days a guy can take. I don’t think I have posted this before…this was a quick shot of a tire swing in somebody’s yard. This was a small town in coastal Maine. I hopped out of the rental car and took a few quick shots here and there. Mid-day, harsh light, but what can you do? – waiting around was not an option. Besides, in such a situation I’m always afraid the camera police are going to show up and hassle me – they never do, but I still worry about it every time! Hey it’s a balcony in Old San Juan, Puerto Rico! I’ve been going back through some old material and applying some new post processing to a few here and there. Old San Juan is very photogenic for those of you who like to shoot architecture, especially doorways, windows, balconies, streets etc. I’d love to go back someday. Desperate for blog ideas….. Check. Concoct overcooked HDR of colorful bench at Margaritaville, Grand Turk Island…. Check. Wish I was there….. Check. I was driving today in the oppressive heat, and for some unknown reason it occurred to me to try a single exposure HDR from one of the night images I took in Puerto Rico a couple of years ago. This is strange because I don’t recall thinking about these at all for a couple of years. Does this sort of thing happen to anybody else? A sudden idea about a certain photo or photo in your archives? Anyhow, this is the Celebrity Cruises Celebrity Solstice, docked at Old Puerto Rico. My wife and I were on the ship next door, so to speak. The Solstice was lit up like a city, and I thought it was visually attractive. Having no tripod, I had to crank up the ISO and brace on a handrail if I recall correctly.